What is a Hot Tub Massage? Posted on December 15, 2017 , in Hot Tubs. If you are new to the world of hot tub massages you may be in for some serious health benefits. A hot tub is designed to provide a therapeutic massage via jets of water streamed in all the right places. The jets will massage specific areas of your body that may cause problem areas. For example, if you are having joint or muscle pain, the streams can target those areas. Otherwise, it is fantastic for relaxation and to just de-stress. A therapeutic massage requires three things heat, water buoyancy, and massage jets. When combined you will be able to experience the most relaxing hydromassage experience. The increased high water temperatures increase your body’s temperature, thus promoting circulation. The second requirement, water buoyancy can make one feel like they are floating. This floating sensation relieves pressure put on the joints and muscles. Lastly, massage jets apply the appropriate amount of water and pressure to the areas of your body that need it most. 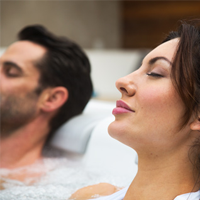 If these sound appealing to you, we have taken the time to highlight how to best shop for a hot tub with these benefits. When it comes to providing a quality therapeutic massage, jet placement is much more important than jet quantity. Typically multiple jets are a good thing, but this does not mean that they are designed for therapeutic purposes. When looking at different hot tub models, be on the lookout for ones that advertise programs for different symptoms and conditions. These programs will typically provide information on how back pain, leg pain, arthritis, inflamed joints, insomnia, or headaches can be relieved with their certain settings. Unlike some hot tubs, Hydropool models are designed with input from chiropractors and physiotherapists, along with extensive research. They have worked to decide on what the best placement and jet range would be to provide the most luxurious massage experience. One particular style that is popular among Hydropool owners is the four-zone system. This system allows the user to choose a therapeutic program from a touchpad. All they have to do is select the program they want, sit in the labeled seat zone one, and then they will be notified to move to the next seat. From there the user will experience the most personalized full body therapeutic massage. This four zone system is so popular because it allows the user to select massage programs for specific conditions such as neck pain or spinal tension. When you decide on a hot tub that allows for personalized tailored massages, you are investing in the whole family. Hot tubs that offer a number of different massage options are often best because the jets are strategically placed. These hot tubs will provide the widest range of massage possibilities. If you are looking to take your massage experience one step further, incorporate aromatherapy and chromotherapy (light therapy) into your hot tub massage routine. With these added benefits you will only reduce your stress, even more, enhance your mood, promote better sleep, and wake up feeling more energized. To learn more about the massage benefits of hot tubs, click here to download a hot tub buyer’s guide.